Chromium is a trace mineral essential to human health. According to the United States Department of Agriculture, approximately one in ten Americans achieves the minimum recommended daily requirement for chromium (50 mcg). Supplementing chromium can help maintain healthy levels within the body. Absorption of chromium from the intestinal tract is low and chromium reserves are easily depleted with high-sugar diets and excessive exercise, but absorption can be enhanced with niacin. Once chromium is properly absorbed, it is stored in the liver, spleen, soft tissue and bone. Chromium is considered a cofactor of insulin, the hormone responsible for regulation of the metabolism of carbohydrates, fats and protein. Chromium acts as a seal between insulin and the receptor sites on cell membranes, supporting regulation of sugar and glucose transport into the cells. Chromium is essential to the efficacy of insulin in the body and contributes to blood sugar balance. Some studies indicate that taking chromium supplements can also contribute to bone health and longevity. 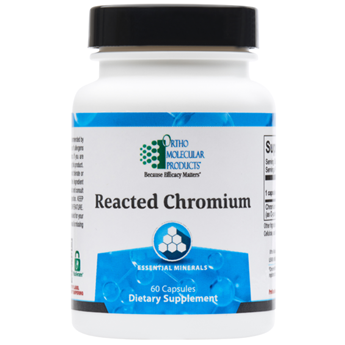 Reacted Chromium includes 200 mcg per serving of chromium, ideally formulated using the superior chromium polynicotinate (niacin-bound) form for enhanced absorption and superior function. Chromium enhances insulin control, promotes healthy glucose metabolism, and supports appetite control.